Why 1φ IM not self starting? How to make 1φ IM self starting? Single phase motors are the most familiar of all electric motors because they are extensively used in home appliances, shops, offices etc. It is true that single phase motors are less efficient substitute for 3-phase motors but 3-phase power is normally not available except in large commercial and industrial establishments. Since electric power was originally generated and distributed for lighting only, millions of homes were given single-phase supply. This led to the development of single-phase motors. Even where 3-phase mains are present, the single phase supply may be obtained by using one of the three lines and the neutral. Here, we shall focus our attention on the construction, working and characteristics of commonly used single-phase motors. 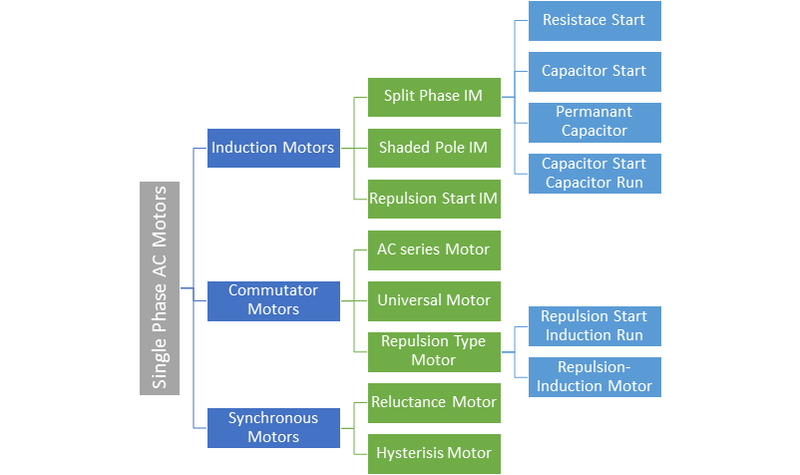 A brief comparison between three phase and single phase motors are given below. Single phase induction motors are simple in construction, reliable and economical for small power rating as compared to three phase induction motors. The electrical power factor of single phase induction motors is low as compared to three phase induction motors. For same size, the single phase induction motors develop about 50% of the output as that of three phase induction motors. The starting torque is also low for asynchronous motors. The efficiency of single phase induction motors is less as compare it to the three phase induction motors.